There are two types of activity notifications that can be assigned to calendar activities, Action and Timed based. ‘action based’ Notifications – these text messages are sent out when specific actions are made, such as creating or moving an activity. ‘time based’ Notifications – these are automated text messages sent to recipients at configured times, such as pre-appointment reminders and follow up messages. When you add an activity, or edit an existing activity within the calendar the contact associated to the activity will be sent a text notification of the action if you have chosen to send them notifications. From the Activity Types list, click into an activity and under the heading ‘Edit action based notifications’ select which message you wish to edit. Choose which of the messages you wish to change and select the edit box. Send Default Message and Send Custom Message. 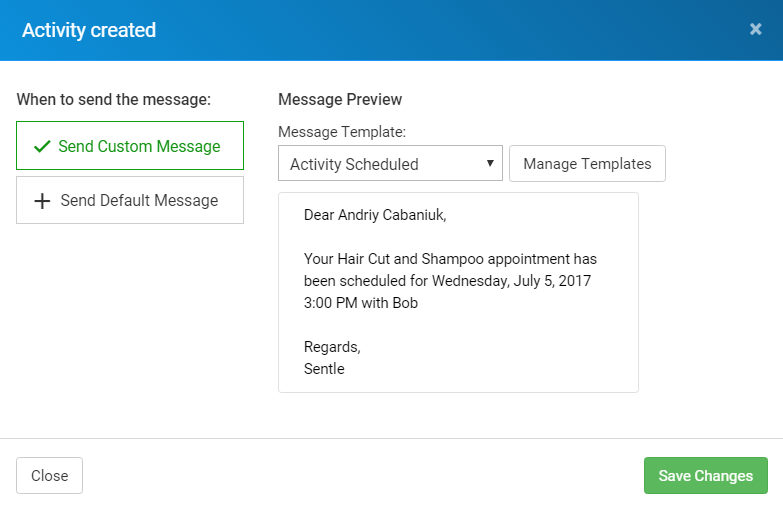 Default messages are created by Sentle using the information included within the calendar (such as contact name, service, date/time etc) The message that will be sent in this example will be displayed in the preview window. Custom messages are sent my assigning pre configured message template (see template doc) Select which template you wish to use in this case and you’ll be given a preview of the template. Select save changes. Timed notifications are those that can be configured to be sent at specific times related to the activity or event such as pre-event reminders or follow up messages. Select ‘add a new timed notification’ to create a new message. In the window the is displayed (see below) you have the following options available to you. Message Template: Choose which of your predefined templates to use for this message. Manage Templates: Will take you to the template manager where you can create a new template if required. The next elements of this window are where you will start setting the timings. Choose which time increment in which to send the message (minutes/hours/days) and select the specific time period. These will change depending on which increment you have selected with the minimum selectable set to 5 minutes and the maximum currently set to 3 months. The text and message within the green box will change to describe which type of message you have configured. Your selected message template will also be displayed on the screen. In the message list for any activity related to contacts (not just Sentle staff) you will notice a message called ‘Default Sentle Reminder’. We’ve added this as a starting point for you but appreciate that you will probably want to change the time of the activity reminder to suit your business requirements. You can do so by clicking into the message and following the steps described above.